Get your message out in style with this custom cast sign. Each No Trespassing sign is cast in one piece from rust free aluminum and coated with our exclusive tough Alumi-Shield™ finish to withstand all outdoor weather. 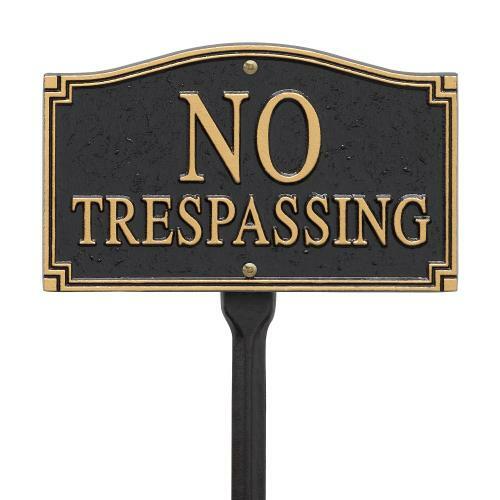 Each sign includes an 18 inch lawn stake for easy placement. Text is permanently cast on the sign. Alumi-Shield™ - Protects against the harshest weather and environmental elements. Extends the product life and maintains the look and function.